Hawa beach or Eve's beach lies opposite to the Light house beach. 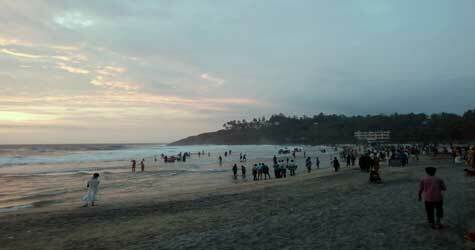 Many tourists claim it to be the most beautiful among the beaches in Kovalam. The exquisiteness of this Kovalam beach is enhanced by the stack of palm grooves which reward a unique elegance to this place. The beach in the early morning is found crowded with native fishermen who rely completely on the sea for their living. Chanting and singing of these people in their local language along with the cadenced waves create a great acoustic treat for the visitors here. Hawa beach is separated from other beaches by the foreland of Edakkalu. From here, you can get the majestic view of sunset at its apex grace. After the sun sets, the calm cove of waters in the beach provides a visual charm of moonlit nights. Kovalam tourism is also famous for the mouth watering cuisines here. To satisfy your taste buds you need not have to get into any high class Kovalam beach hotel; there are lots of small restaurants all along the beach sides. The dishes here not only quench your hunger but also provide a new unique experience. When it comes to accommodation, a typical Kovalam beach resort will definitely include all the facilities which you would love to have. Besides accommodation and food, the management here takes extra care to avail the customers with well tailored customized services as per their demand. Thus you will never feel as if you are far away from your home. There are numerous activities within the resorts itself and you will always be kept entertained. There are lots of tourist places in Kovalam but honeymooners always prefer to be in beaches and Hawa beach is obviously a sensible choice for them. With your soul-mate's hand in yours, you can simply walk through the long sandy shores and relax. If you love adventure, you can enjoy any of the adventure sports at Kovalam beach together and please make sure that you adhere strictly to the instructions provided. The currents in this beach are quite stronger than other beaches of Kovalam and this must be always kept in mind to assure your safety. Though you will see lots of westerns taking sun bath in bathing suits, it would be polite to pay a little attention to dressing when you walk near to the mosque or in the palm groves. This will avoid unwanted attention. Kovalam is renowned for the ayurvedic massage parlours here and the herbal treatments available are really affordable by almost every sector of tourists. This is not just a means for relaxation but ayurvedic massages have lots of health benefits which are scientifically proved.